Home » Gardening » A Harvest Too Soon??? According to our planting instructions and everything on the internet, corn is supposed to be ready to harvest between 71 and 91 days (depending on the type of corn you plant). We harvested this crop at 94 days old, so looking at the stalks and the calendar we figured it was the right time to harvest. Our crop was affected by a series of problems: location, pests, watering and fertilizing. Three of the problems are areas that can be totally controlled by us. The pest issue is something we are going to have to deal with no matter what we do. The corn received the right amount of sun required for them to grow, and we think that they might have been too crowded in the tubs they were growing in. Amanda followed the instructions on the packets “to the T”, but we still think it was too tight. I’m going to get our neighbor’s kids to help us move those tubs out and we’ll dig inside to see if the roots were bound. I also just used the typical Miracle Grow (for vegetables) fertilizer, and didn’t pay too much attention to other things the plants might have needed… yes, we now know that was a mistake. We also had a couple of times where there was some miscommunication where neither Amanda or I watered the plants or watered them twice… also a mistake. 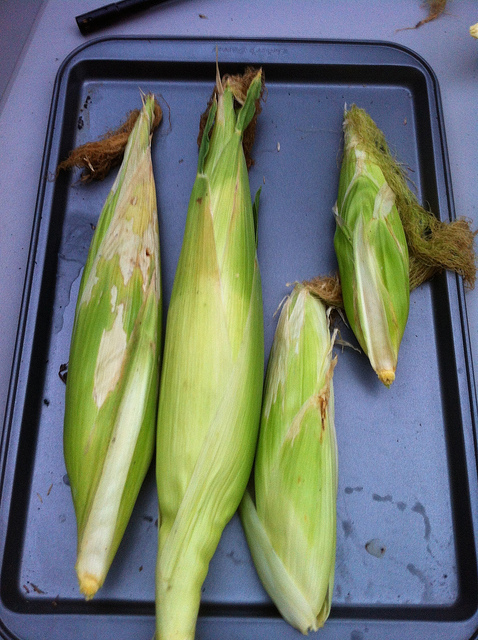 When we started to open the husks we noticed that a lot of the corn was still well underdeveloped. 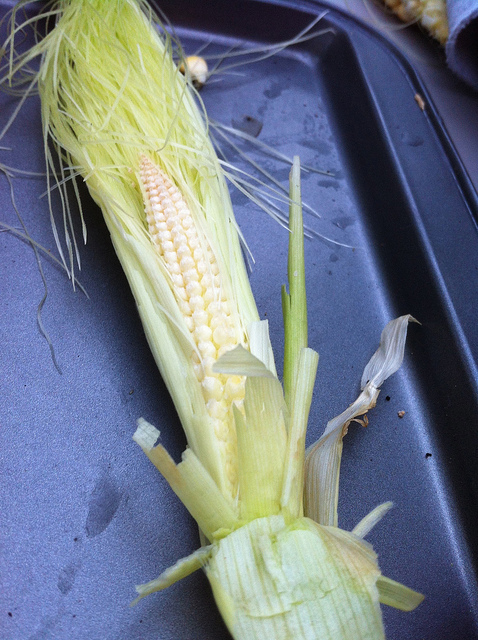 We either had baby corn, or in one case only had one kernel developed on the cob. We also got to see what the damage that the Leaf Leg bugs did to the crop. Its very interesting to see the damage, each kernel they eat from turned purple/black, almost looking like a horrific cavity. Now that we know what they look like, we will start to erraticate them at an earlier time when we see them on our crops. 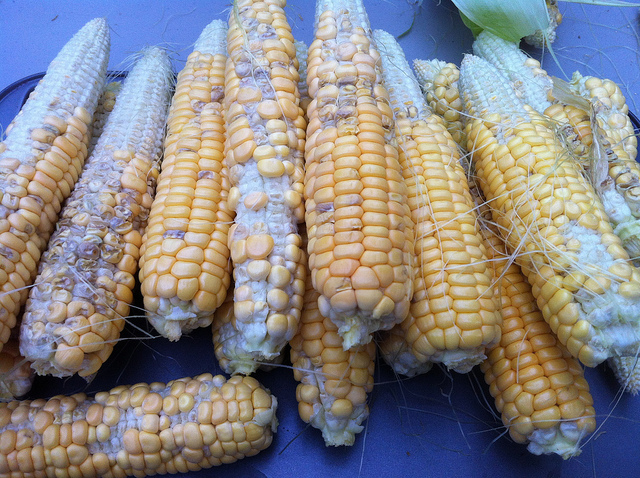 We shucked all the husks which amounted to about 24 cobs, we had to completely trash a couple of them, either due to their immaturity or the amount of damage the received from the pests. i just hate that feeling of putting all of our time and money into something, and simply having to throw them away. 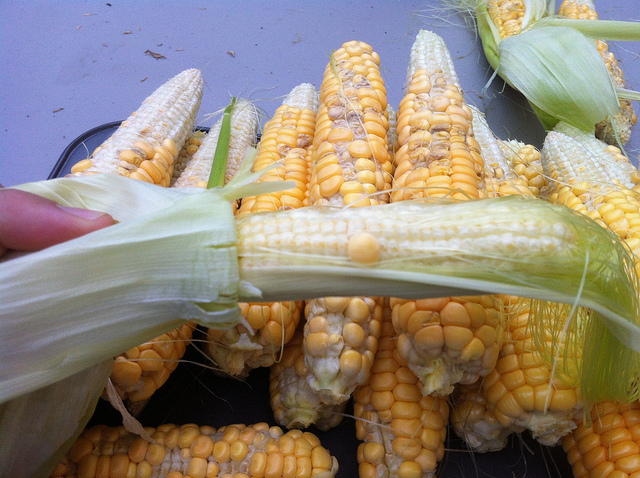 Our fears where justified, and since using the whole cob for grilling or boiling was out of the question, we set the corn to dry for a day and then Amanda painstakingly picked each kernel off with her fingers so as to salvage, and not squish or burst any kernals with a knife. The final harvest amounted to about 2 cans of corn, enough for one meal. Such a sad end, but we learned A LOT for our next attempt!! !